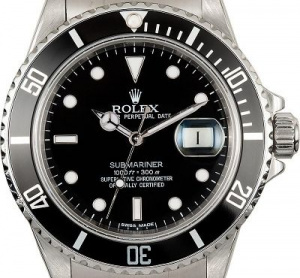 Rolex Submariner 168000 is a particular reference produced after 16800 and the main but not visible difference between the two watches is the use of a new stainless steel called 904L instead the 316L used so far. In this reference, the caseback and the bracelet is still produced using the old 316L steel and the dial is only glossy. After the 168000, all the Rolex stainless steel production has gradually moved to the new 904L metal alloy. This article continues... take a look at our Wiki to know more about Rolex Submariner 168000.